PALOMAR MOUNTAIN – This past Sunday, two solo motorcycle crashes happened at the identical spot on South Grade Road just north of State Route 76 in Palomar Mountain, in north San Diego County. The first accident involved a 29-year-old rider on a 1997 Ducati at approximately 1:30 in the afternoon. The rider apparently lost control and ran into an embankment, suffering fatal injuries. An hour later, another motorcyclist (riding a 2007 Ducati), crashed at the EXACT SAME spot. This rider survived the crash and, as he was hiking back to the road, found the body of the first biker. The two were not riding together, and did not know one another. CHP authorities surmised that both accidents were caused by excessive speed, and added that: “accidents are common” on that stretch of Palomar Mountain. As motorcycle accident lawyers, we see many accidents caused by careless automobile drivers, but the motorcycle accidents in this case were easily prevented. High performance sport bikes like the Ducati motorcycles ridden by these guys are serious machines. Before riding high-perfromance bikes like these, riders need sufficient experience and training. 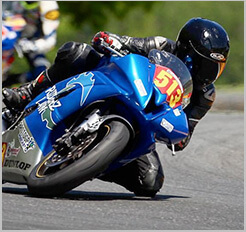 One of the biggest mistake new riders make is riding a motorcycle that is too powerful for their experience level. Another common mistake is riding too fast for the terrain, or racing in unfamiliar terrain. We aren’t just lawyers who sit in an office all day: we’re riders ourselves. We’ve been up and down lots of twisty roads in the hills of North County San Diego: it’s a beautiful area and a blast to ride, but it’s also extremely dangerous if you aren’t careful. Our hearts go out to the fallen rider and his family, but this accident never should have happened. We urge all of our clients and readers to ride safely and responsibly. Have fun, but be smart: don’t become a statistic.